Thousands of designers, marketers, and product managers have come to rely on Susan Weinschenk's original 100 Things Every Designer Needs To Know About People as a "go-to book" for practical advice on how to use the latest findings in psychology and neuroscience to directly inform and improve their designs, brands, and products. Research hasn't stopped since the book was written, and new design challenges have emerged. 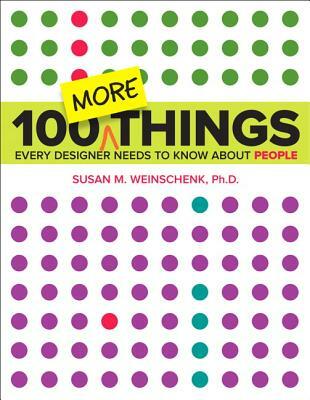 Weinschenk's new book, 100 MORE Things Every Designer Needs To Know About People applies the latest research in psychology, neuroscience, brain research, and social psychology to the design of technology products, including websites, apps, wearables, and artificial intelligence. Weinschenk combines real science and research citations with practical examples to make her 100 MORE Things engaging, persuasive, easy to read, accessible, and useful. 100 MORE Things Every Designer Needs to Know About People is not just another "design guidelines" book because it explains the WHY behind the guidelines, providing concrete examples and prescriptions that can be easily and instantly applied. Susan Weinschenk has a Ph.D. in psychology and over 30 years of experience as a human factors and user experience consultant to Fortune 1000 companies, start-ups, government agencies, and non-profits. Her clients call her "The Brain Lady" because she applies research on brain science to predict and explain what motivates people and how they behave. As the CEO of The Team W, Dr. Weinschenk speaks, teaches, consults and mentors teams on the design of websites, software, apps, TV ads, physical devices, experiences, and physical spaces to make them engaging, usable, and motivating. Her clients include Medtronic, Walmart, Disney, Amazon, Mayo Clinic, and the European Union Commission. Dr. Weinschenk is also an adjunct faculty member of the University of Wisconsin, and writes two popular blogs: www.blog.theteamw.com and the "Brain Wise: Work better, work smarter" blog for Psychology Today. She is also the author of several books including 100 Things Every Designer Needs To Know About People, 100 Things Every Presenter Needs To Know About People, and How to Get People to Do Stuff. She lives and works in Edgar, Wisconsin.